While rugby isn’t a sport played nationally in the United States, that hasn’t hindered student interest at the University of South Dakota. The USD women’s rugby club is made up of about 20 women who come from different backgrounds and experiences, striving to learn and compete in a new favorite sport of theirs. Occupational therapy graduate student Erin Krause, who is also the president of the club, said most don’t know anything about the sport before they join the club, but once they learn the game, they tend to love it. Along with Krause, first-years Hayley Snodgrass and Allisen Olson both had never played rugby before coming to USD. Olson is one of the few in the club whose interest in the sport already existed before coming to campus. Others like Snodgrass joined because women in their dormitories were joining the club as well. Both Snodgrass and Olson played several sports in high school, so to be able to compete in a sport on a collegiate level is something they have enjoyed. For both students, though, the best part about the club isn’t competing, but the social environment of the club. Krause agreed with Olson and said she has met some of her closest friends since joining the club three years ago. She hopes other women at USD will join the club next year. The club is currently in its spring season, where they have to schedule their own games. They compete with other schools in the area including South Dakota State University, Augustana College, Southwest Minnesota State University and Wayne State University. The club also gets to play in a couple tournaments, and a few members have even been selected to the Prairie States Select Side team which will compete in Davenport, Iowa this weekend at the Midwest LAU Championships. 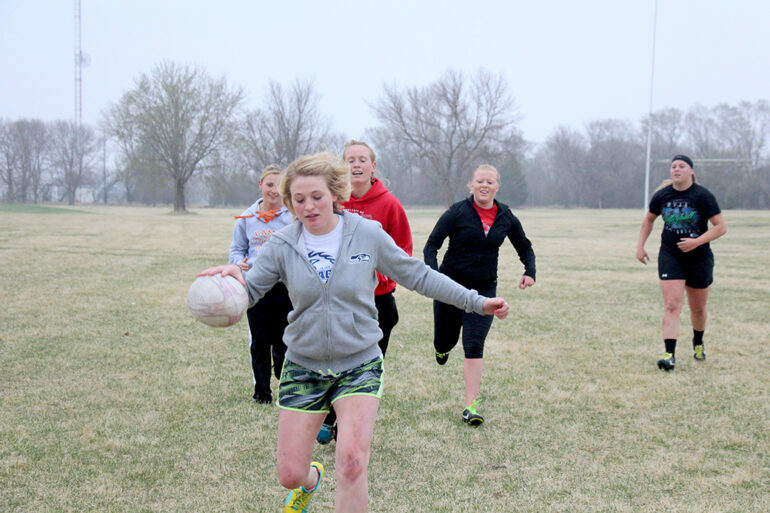 While the spring season for the rest of the team ends this Sunday at the Sioux Falls Phantom Women’s Rugby Tournament, Krause hopes more women will join the club for its fall season next year.